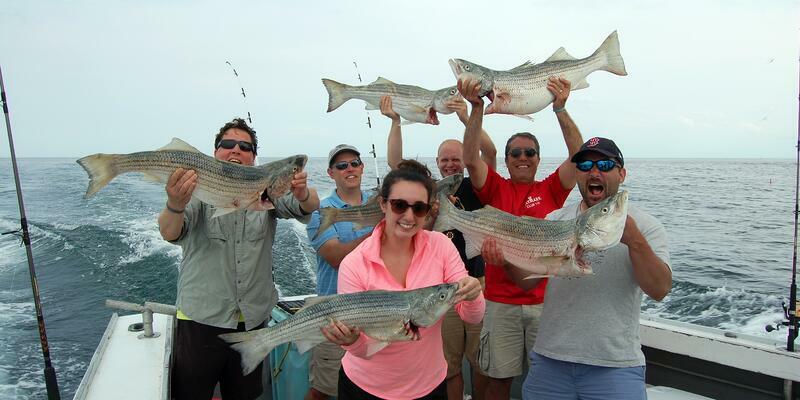 Lexington, MA, July 9, 2015 – At Daymark we follow the "work hard - play hard" approach, and last week Daymarkians got to enjoy a day on the ocean during our 14th Annual Daymark Fishing Trip in Gloucester. The trip was an opportunity to have some fun, practice our team-building skills, as well as promote some healthy inter-company competition. Employees were divided into six teams and prizes were awarded for the first fish caught, the most fish caught, and the largest fish caught. The competition was fierce, and everyone gave it their all, but at the end of the day, Team Connemara Bay took home the top two prizes, bagging the first fish and largest fish of the day, a 37.5 inch striper. Team Bounty Hunter took home the prize for most fish by changing up their strategy and going after haddock. When it was all said in done, Team Bounty Hunter netted a total of 27 haddock! After an exciting day at sea, The Justin Beech Duo set the tone for the evening with some great covers from the likes of Stevie Ray Vaughn, The Who, and Steely Dan. The clam bake was delicious and the company was even better. While this was an employee appreciation event, we’re always looking to take our customers and prospects fishing off Gloucester. Whether you love to fish, or are looking to experience deep-sea fishing for the first time, we’d love to take you out for the day. Sound like fun? Great! Click here and we’ll contact you. Daymark Solutions is a 14 year old technology integration and solutions provider that helps organizations throughout New England effectively architect and implement customized solutions to help their clients grow and scale their IT infrastructure. Specializing in data center infrastructure, data protection, virtualization, cloud and managed services, Daymark’s unique combination of in-depth technical knowledge, extensive experience, and proven methodologies enable its clients to successfully address even the most difficult technology challenges. For more information, call 781-359-3000 or visit www.daymarksi.com.